Kukuu always go the extra mile with their modern nursery style – asymmetric shelves, beautifully etched surfaces and the use of elegant fabrics – all making for show-stopping pieces of furniture radiating European design style. We previously looked at Kukuu’s sublime Bird & Berry cot and change table back in February, but we’re tickled pink by the rest of the Bird & Berry collection. The Bookcase ($795), with its fun shelving and pull out storage box, is perfect for any nursery or playroom and a piece that I’m sure will still be utilised well into your child’s teens. I fall hard for child-sized furniture, so naturally my favourite pieces are the Play Table ($295) and Play Chair ($150). Superb craftsmanship results in a magnificent quality product, and the white washed birch finish is beautifully modern and clean – no matter how many crayons are strewn over the surface! 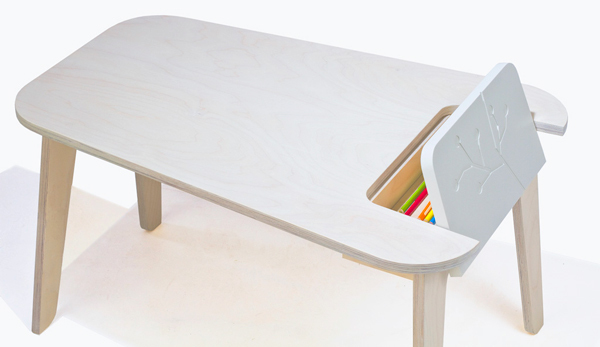 A fun hidey hole for pencils is a fun inclusion and means pencils are always within arm’s reach. Find all of these and more from the Kukuu Bird & Berry collection at Urban Baby.